Today I'm going to talk about an advanced and rarely used skill set used by most players. Today I'm going to discuss varying the timing of your shot. There are a number of benefits to doing this, but first I'll get into some of the reasons why most people don't do this. Most people just hit the ball when they get to the ball. This seems like an obvious way to play your shot. You get to it so you should hit it! A lot of the times people are happy just to get the ball back. You could do very well playing like this. Even some top players (more so women) do this. The difference when these top players set up to hit a shot is that they don't look rushed. They are balanced and look like they could hit a number of various shots. The reason I said above that more women just get to the ball and hit it is because to delay your shot it takes two things; first you have to be at the ball early and second you have to be able to delay your shot/swing. Some women are able to do this on the forehand side and it is equally challenging for anyone to do this on the backhand. So what exactly is holding the ball? It's getting to the ball early and set up as if you were going to hit your shot before you actually do. 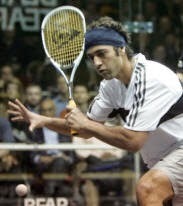 Can you tell which shot Shabana (below) is about to hit and when exactly he is going to strike the ball? Is he going to just hit the ball normally or is he going to use a late rapid racquet head acceleration to flick the ball into a drive or a trickle boast? If you can do this well you will cause your opponent some major headaches. Why the headaches you ask? Holding the ball messes with a persons natural movement and split step at the T. If this person splits too early or has their weight shifted to one direction before you hit they are in a vulnerable state. In this fragile state their centre go gravity is not between their legs and slightly in front of them. The person may become flatfooted or leaning to one side and will have a lot of trouble if the ball is hit in the other direction. Basically you take the person out of their athletic stance and make them move like an amateur would with no anticipatory skills. That is if you do it well! I started playing with the timing of my shots when I was a kid as I idolized Jonathan Power. I began to realize that there were a lot more options and ways to be creative and deceptive if I learned how to do this. Here are a few key points I leaned about this skill along over the years. 5) It takes a lot of solo hitting to strengthen up your forearm to be able to do this extremely well (shorter swing with greater power means more deceptive and possibilities). 10) It's a lot of fun to 'taxi' someone! If you want to work on your holds and varying the timing you hit the ball here are some of my favourite drills and pointers. - try changing the velocity of your swing (speed it up or slow it down part way). slowing it down I find to be much more challenging. - most people show tension in their arm when they intend to hit it hard as the approach a ball at the front. think about this tension and how you can minimize it so you can disguise when you want to drop. 5. A boasts, b has the option to hit a straight drop of crosscourt drive, if B drops A crosscourts and you switch, if B hits crosscourt then you boast. You can also tweak this drill by adding a switch on a volley on the crosscourt drive to make it more challenging). 4. A game serving with a back wall boast/or a high boast from the back. You can play a whole game with one person starting in the front or switch so the winner starts in the front in the attacking position. 5. Solo hit from the front of the court to shorten your swing and strengthen your forearm. That's it for today. This is one of my favourite subjects. You need to be patient with it, but it can be a big weapon if you master the art of the delay. Have fun changing the timing and rhythm of your swing; hit the ball early, other times delay it and you will be adding an advanced skill to your bag of tricks. I am in the green shirt and it's two friendly games early on a practice night. I have some thoughts about my own strengths/weaknesses/style of play that I could share if that would be useful for some context? Who's The Best Squash Player Of All Time?